America's Boating Course - 3rd Edition is our primary civic effort toward public instruction in the fundamentals of safe boating. Both short (8-hour) and long (16-hour) formats are designed to familiarize the student with the fundamentals of safe boating and qualify for certification in most states that require boating education before operating a watercraft. The long (16-hour) course covers all that's included in the 8-hour course and adds basic information on both paper and digital charts and basic piloting techniques, equivalent to the full version of The Squadron Boating Course. 2012/2013 ABC3 Materials. The 2015 NASBLA approved ABC3 materials are the only education products for ABC3 being shipped. In recognition of the financial impact on squadrons with 2012/2013 Student Manual in stock, use of these Student Manuals should continue until stocks are consumed then transition to the 2015 Student Manual. Effective 1 January 2016, only 2015 ABC3 Instructor materials embedded in the 2015 ABC3 Instructor Kit CD are to be used (Instructor Manual/examinations/PowerPoint). 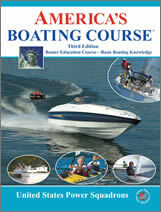 America’s Boating Course, 3rd Edition (ABC3): USPS' ABC3 is the sole basic public safety boating course supported by USPS and approved by the National Association of State Boating Law Administrators (NASBLA). It has been approved by most states, and is offered in two parts. Part 1 is the 8-hour (Chapters 1-4) format and Part 2 includes Chapter 5 plus appendices. Part 1 coupled with Part 2, Chapter 5 comprises the 12-hour course. Chapters 1-4 focus on Federal laws and state licensing requirements, and Chapter 5 introduces the student to the use of charts and piloting. The classroom version of ABC3 is presented by USPS Certified Instructors only. The ABC3 student manual is "Copyright 2008 United States Power Squadrons Reprint 2012" to distinguish it from prior editions. Student and Instructor materials to support the ABC3 course (Student Manual, Instructor Manual, Instructor CD with PowerPoint files, bonus CD and DVDs for the student, assessments, answer sheets, diplomas) continue to be obtained from the On-Line Materials Catalog & Shopping Cart on the USPS Education Department Home Page. Assessment Examinations: Testing and verification are used to assess student comprehension. This includes classroom interaction, completion of the four end-of-chapter reviews, and a 50-question final multiple choice examination at class end. Education on state boating laws is specific to the state’s laws and assessed typically by a 10-question multiple choice test in addition to the 50-question NASBLA approved exam. Students who complete the Chapter 1 through 5 “12-hour” program receive the endorsement “Includes Introduction to Coastal and Inland Navigation Endorsement” (programmed in the HQ-800 12-hour class diploma printing event) on their Certificate of Completion. Minimum passing score for all ABC3 related exams is 80%. All multiple choice examinations are closed book, proctored by USPS members as arranged by the Exam Administrator, and scored by designated personnel other than the instructors. Two ABC3 final examinations are provided. Those not passing the initial assessment may, after additional study, retake the second exam. State-specific test questions are provided by the respective states and may be downloaded from the EdDept Home Page under the “State Boating Info” pull down tab. Additional evaluation direction may be included with the questions. The state specific examinations are in a protected directory to which DEOs have access. Successful completion of the NASBLA approved 2012 final examination leads to issuance of an ABC3 Certificate of Completion and accompanying wallet card. Course Completions: There is one report, submitted electronically, that records completion of each public boating class (and seminar). 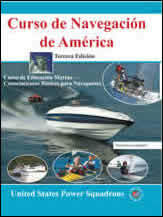 The report is made through either the HQ-800 System or the Boating Course Assistant version 7 (BCA 7) software. Both programs are easily accessed from the USPS Education Department web site. While each is unique with various additional aids to administration, they integrate the necessary information from the Student Registration form (ED46) and Course Answer sheet (ED-26) into a data record which is uploaded to USPS Headquarters. Both allow for pre-registration by students, a feature that aids compilation of data for reporting purposes. These programs include printing student information on the Certificate of Completion. The first two documents, based on fictitious squadron NoneSuch #5999, are PDF files that allow members who are unfamiliar with HQ-800 software to try out the procedures to register a course or seminar in the program, administer student registration, enter student information for uploading to the National data base and note the “proof of receipt” in an ED-27 report, all without actually entering false data on the National data base. These two aids are excellent learning tools for new DEOs and SEOs. These files are for use by USPS members only, and you may be asked to provide your USPS certificate number and your PIN when accessing these files. Please note that with the protected files, the system will try to rename any file you save to your local computer. When the window opens for the download, please rename the file you're saving to something meaningful for you. Be sure to include the correct file name extension (e.g., .ppt for a PowerPoint file).